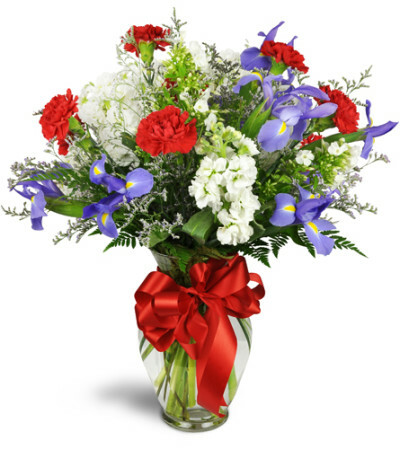 Your favorite patriot will love this gorgeous red, white, and blue floral gift! Red carnations, blue irises, and white stock blooms evoke 4th of July sentiments, Memorial Day remembrances, and good ol' summertime joy. This is the perfect gift for a returning soldier or proud family member of a service man or woman. Red carnations, white stock blooms and blue irises are arranged in a shapely clear glass vase and adorned with a festive red bow. Flowers were nice. I was thinking for the Deluxe that might mean a few more roses than the standard, but I should have asked. The flowers themselves were lovely. Just what I asked for. I would use The Floral Basket again. It was late morning when I placed my order and asked for same day delivery. They put together a beautiful basket for my friends birthday. Very happy!! As always...gorgeous flower arrangements combined with excellent service! 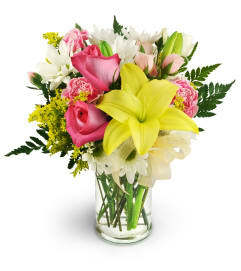 The Floral Basket is a Lovingly Florist in San Antonio. Buying local matters. Discover how Lovingly supports local florists. 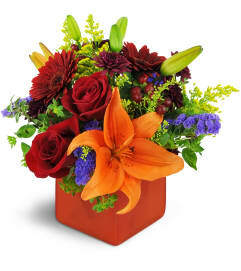 Copyrighted images herein are used with permission by The Floral Basket.